I am amazed by the fact that how the taste buds change over the years. I still remember to this day, my first meal in US at my parent's house. I was doing my school in India while my parents were here. So I joined them later after getting married. After the long 18 to 22 hrs of jet lag and wait I was welcomed by my hubby and parents. Later in the evening my Mom prepared a whole spread of dishes for her daughter thinking that she would be enjoying them. I couldn't enjoy a bit what she made. It was not only because of the excitement, but also by the taste difference. Everything tasted bland for me. I even suspected my Mom's cooking skills. She was a good cook back in India, may be she doesn't cook any more here. She must have lost her taste buds so bad...But when I came back to my hubby's house, it was even different, those were the times, and I craved for a hot and spicy chutney or pickle. Later it became habitual and the taste buds adjusted to the environment. I am sure most of you guys might have encountered this situation at least once. Looking back, I can say that my spice tolerance level trended down all the way on the graph from those days. You will start with a higher point on the graph, but when kids starts to eat solid food, it goes little bit down. Over the years, it goes all the way down since you make adjustments for your kids and get settled at a point tolerable for the whole family. I would have never enjoyed a hot and sweet chicken 15 years ago, but now the taste palate has changed so much that this oriental dishes has become my favorites. 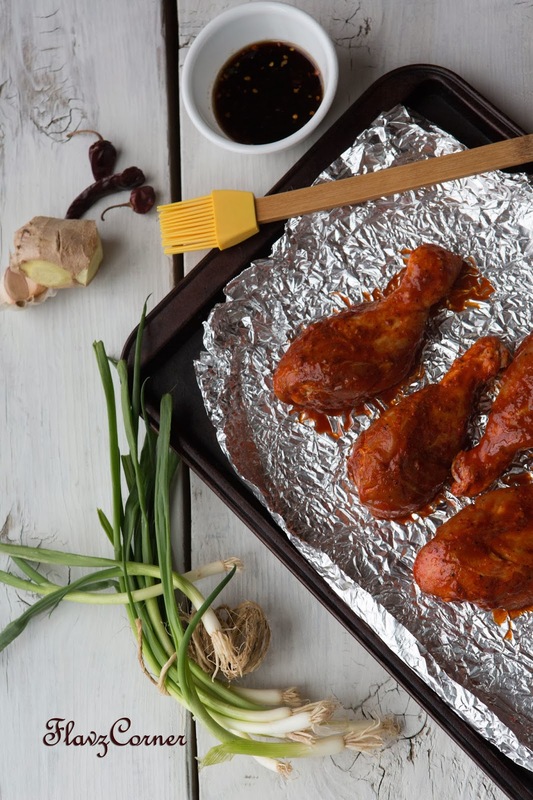 My kids love these sticky sweet and hot chicken drumsticks. They are super delicious and you would be asking for more!!! Clean and pat dry the Chicken drum sticks with a paper towel. Make small cuts on the chicken or using a skewer poke some holes on the meat. Mix all the ingredients under marination list and coat well on the chicken. Refrigerate for minimum 8 hrs or over night. Line a baking sheet with aluminum foil and apply cooking spray. Drain excess juice away and place the ckicken on the tray. Bake the chicken covered with Aluminum foil for 30 minutes. Remove the cover and cook for another 10 minutes till the juice tries to dry up and the chicken is not pink inside. Mean time mix all the ingredients under sauce and microwave for 30 - 40 seconds and mix well till the brown sugar is melted. Take the chicken out of the oven. Increase the temperature to 400°F. Brush the sauce on both sides of the chicken and pour excess sauce on top of the chicken and bake the chicken uncovered for 5 minutes on each side or till all the juice dries up but still glossy on top. Garnish with sesame seeds and green onions and enjoy while they are warm. It also amuses me how I have too adapted to the local food here in SG. I beleive the taste buds changes every 10 yrs, so that might be one of the reasons. Please let me know how it turns out for you. Thanks! Sure, go ahead and try it and let me know how it turns out for you. this looks like a real treat... love the way it looks... bookmarking this! Sweet does have an affinity for spicy hot, doesn't it? I haven't made a dish like this, but it looks awfully good! And it's interesting how our tastes change over the years. Things I'd never eat as a child, I love now. Anyway, good post -- thanks. Thanks John for the comment!!! Yes, this chicken has got the looks to tempt anyone. These chicken drumsticks look fingerlickingly delicious! I love hot and sweet flavours. Thanks Angie!! They sure are fingerlicking drumsticks!!! Wow, wow, and wow!!!!! 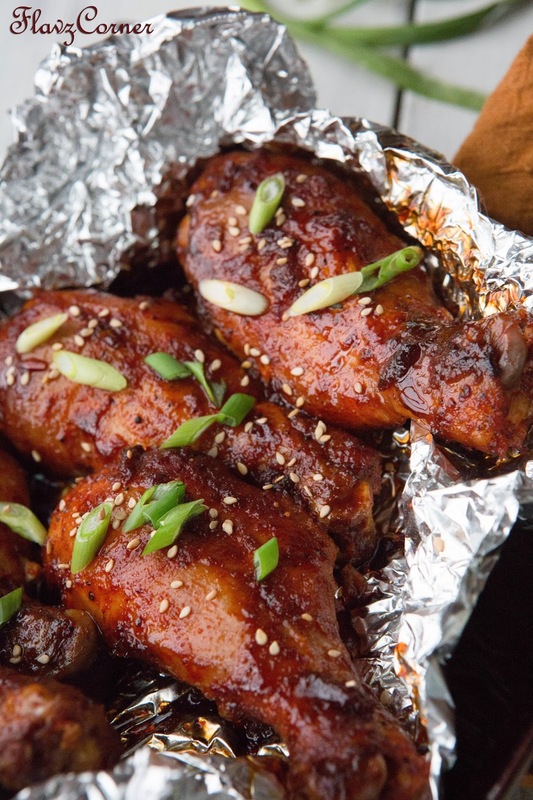 Shibi: These sticky, hot, and sweet chicken drumsticks are to eat many and come for more... I am so pinning this!!! Thanks Denise!!! These drumsticks are addictive!!! Hot and sweet chicken looks so delicious. Thanks Meena!!! Very true, Indian palates takes long to get adjusted. Thanks for stopping by and commenting Chris!!! Hope you will like it. this looks super yumm..loved it..will try this soon..first time here..you have great collection of recipes...happy to follow you. Oh! 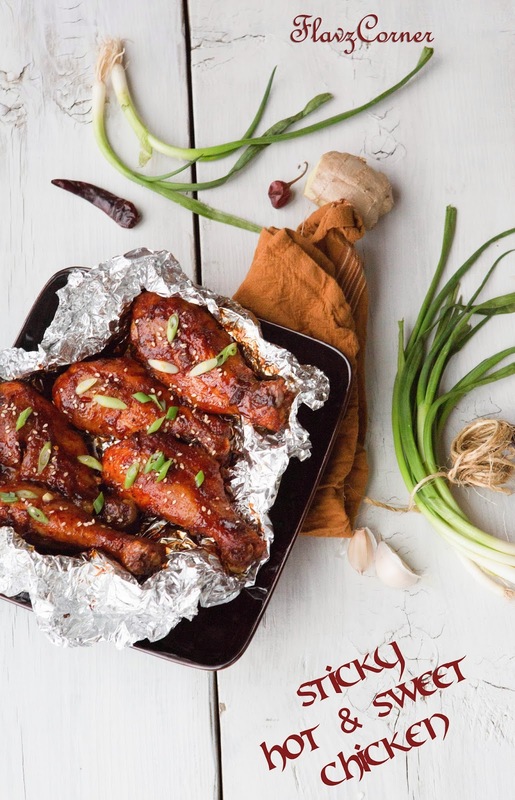 what a sticky yummy Chicken, would be delighted if you could share your recipes with us at http://ipinrecipes.com/ a community for food bloggers and food lovers. With iPinRecipes.com you can directly pin recipes from your blog like Pinterest. No need to edit, crop images and your recipes will be published immediately without any editorial review. So why to wait, join our community and start pinning recipes.